I hope everyone had a wonderful Holiday weekend....ours was a blast! We had a LOT of fun hanging with family and watching the neighborhood fireworks----there was lots of good food too!!! My post for today is my first attempt @ card candy. I'm not mastered at this so I'm really hoping that everyone enjoys what I made. I don't think I'm good @ the bag topper thing either so this entire swap is pretty much built on hope......I'll be uneasy until I see the reactions on their faces when they receive them----which isn't that far off btw!!!! I'm expecting my new goodies today from Mr. Brown---mostly all Big Shot stuff so then I can finish off a few more swaps---I'm off to stalk him now LOL!!! Thanks so much for stopping by and have a great rest of the day!!! This is lovely Jackie, you did a great job. I don't think you'll have a thing to worry about...I would LOVE to receive something like this...and since I'm in a secret sister swap I may just have to "borrow" this idea!...so thanks for the inspiration! Awww Jackie these are tooo cute!!!! These are so cute Jackie! Enjoy your new goodies when you get them! You did a great job. The people who get these are going to love it. ahh what a cute idea! wow! yummy yummy! this is fabulous. glad you had a good holiday. p.s. if you email me your addy, i'll be happy to send that wolf card to you for your son. you can get me at poca62ATcomcastDOTnet. Oh my goodness, these are adorable! You sure do know what your doing! I bet they'll be delighted!! These are adorable, Jackie!!! These are great! They will love them!! Jackie these are just Fabulous! Love them! I'm sure the recipients will be thrilled! They look great to me! I'm sure they'll love 'em! Jackie these are great, you did a fab job. These are great Jackie!! I think you're a master at the bag toppers!! I think you did an awesome job with these Jackie! I am sure they will love them at convention! Oh what fun card candy, Jackie!! Love them all! I think you did a fantastic job, I know I would be happy to receive this in a swap! I think this is very fun and the swap recipients will be thrilled to get them. Have fun with your new "toys". Can't wait to see what you make with them. this are very cute! i think it's a fabulous swap :). Jackie, they look fantastic. If you need someone to test them out I'm your gal *LOL* They will love, love, love them. Say what?!?! Your first card candy! Get outta her! That is some awesome card candy. Way too cute! Super cute!!! its awesome candy...TFS!! Your card candy is yummy!! Love them and the topper! These are terrific, Jackie. Can wait until you share your creations using your new goodies! Your recipients will surely be delighted and are so very lucky to receive these! You did a great job with them. I am sure the recipents will love them. Keep up the good work. And have fun with your new goodies. They are amazingly adorable, girlfriend! I LOVE your card candy!! This would be a perfect project for stamp club! I think these are adorable Jackie! 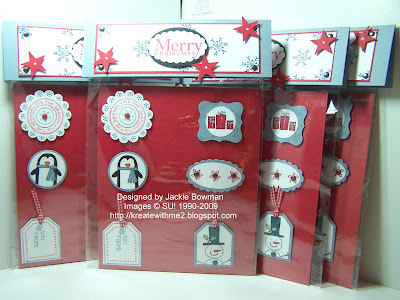 These tags are on my list for Christmas in July, but just haven't gotten to them yet. GREAT Job! A+dorable! I must try this for casing, although I do not have that stamp set! Too cute to resist! When I was leaving the Dentist yesterday I saw the UPS truck pull out of your neighborhood and I actually wondered if it was for you. Now I know it was. LOL! I think your card candy is fantastic. So what Big Shot stuff did you get? I have UPS coming here the next two days, but no new Big Shot stuff is on those orders . . . yet . . .
What wonderful card candy...you did an awesome job on this and the topper!!! These are so cute! Your swap partners will love them!!!! I know I would!! Jackie, you do not have a thing to worry about. Your card candy is excellent. This is a really amazing gift idea. Great for SS swaps.